The Jewish Marriage ceremony is called “ kiddushin” consecration. From the onset it directs the relationship of the bride and groom to a higher plane. The loyalty and emotion that the couple genrate towards each other actually brings the presence of G-d into the home they are creating together. 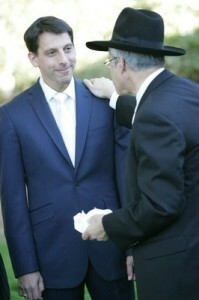 The Rabbi who performs the wedding is known as the “Mesader Kiddushin”. The translation of the word mesader is the one who keeps every facet of the entire process in proper order. As Mesader Kiddushin, Rabbi Becker accepts upon himself this sacred task by making sure that every detail is carried out according to our tradition in a joyous atmosphere that provides a magnificent spiritual experience for the bride and groom, their families and all the attending guests. ....the feedback we have received from friends and relatives has been extraordinary; the one thing they all mention is "the ceremony" or "the Rabbi"....I know that's because you spoke from the heart......the role that Esther played both in the mentoring, counseling and in the events leading up to the Chuppah was indispensable.